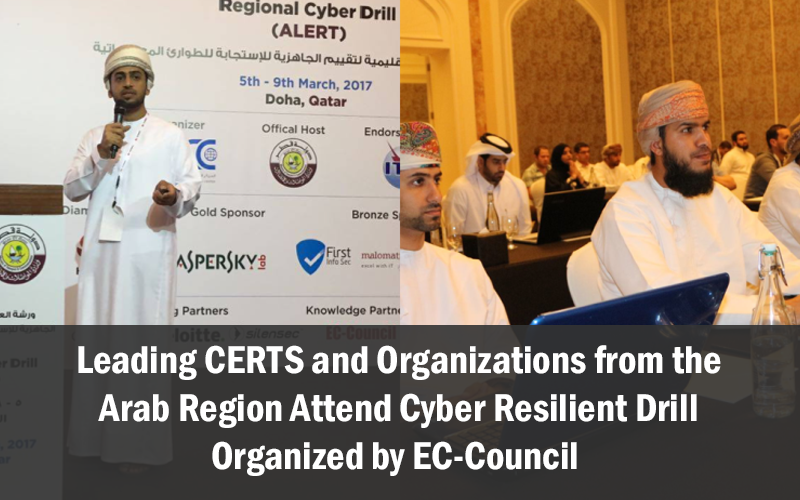 80 delegates from 16 Arab countries participated in a closed-door cyber drill aimed at effectively combating cyber threats in the GCC states by EC-Council. Doha, Qatar, March 9, 2017: As information security becomes the biggest concerns of 2017, traditional technology leaders are scrambling to defend their corporate assets. Even the CERTs (Computer Emergency Response Team), who are experts in handling security incidents, are finding this to be a difficult challenge. To combat the challenge, EC-Council delivered its first cybersecurity workshop titled as “Offensive Defenses in Information Security” under its Cyber Wellness Center (CWC) initiative. 80 delegates from 16 Arab countries participated in a closed-door cyber drill aimed at effectively combating cyber threats in the GCC states, and served as a platform for fostering co-operation and discussions on recent cybersecurity challenges, encouraging interactions, and threat response capabilities. “Fulfilling the vision of creating a safer cybersecurity environment in the Arab Region, ARCC and EC-Council have partnered together to promote cybersecurity awareness mission and ensure a continued and collective effort in mitigating cyber threats among the region’s national Computer Incident Response Teams (CIRTs),” said Dr. Nadher Al-Safwani of Arab Regional Cyber Security Centre. Under its umbrella, the CWC provides training in business-critical consulting and counter measures, in the field of cybersecurity, IT disaster recovery, emergency and crisis management, digital forensics, and information security management. Its objective is to increase organizational and community awareness about cyber security and promote the practice of securing the cyber space by following best practices and defense mechanisms while strengthening the protection of systems and data.